A few weeks ago when we were in Kansas City, we spent some time with my extended family. It was so good to be together again, just hanging out, laughing, and relaxing. While we were there, my aunt mentioned some old recipes of my grandma’s that she had and I jumped at the chance to have her send me some of her favorites. I have started working on trying them out. 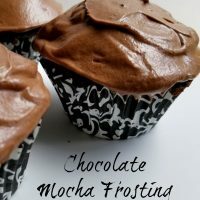 Grandma’s chocolate mocha frosting was the first I tried and it did not disappoint! 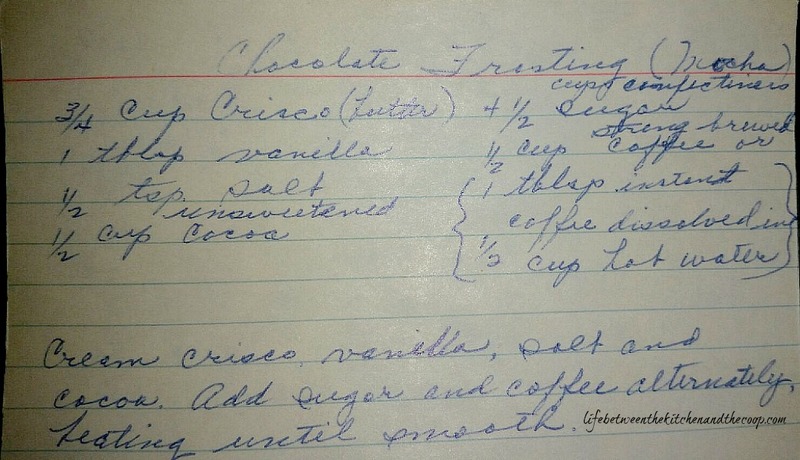 This recipe is in my grandma’s handwriting. Seeing it brought tears to my eyes. I miss my grandma! I’ll be honest. When I looked at the recipe and saw butter-flavored Crisco instead of regular butter, I was skeptical. I mean, I have a relationship with real butter. It’s the only thing I will use. I grew up mostly with margarine, but my former mother-in-law only used real butter and she got me hooked. Anyway, I bought some butter-flavored Crisco baking sticks and gave it a shot. And it was delish. That’s why I’m sharing it with you! You need to try this…trust me. 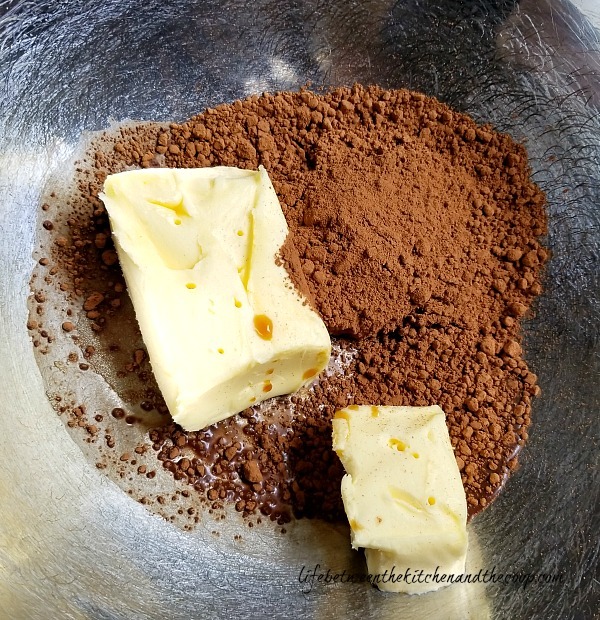 Put the butter-flavored Crisco, vanilla, salt, and cocoa in a mixing bowl. Add the confectioner’s (powdered) sugar and coffee and blend with electric mixer until creamy. Is this stuff gorgeous or what??? 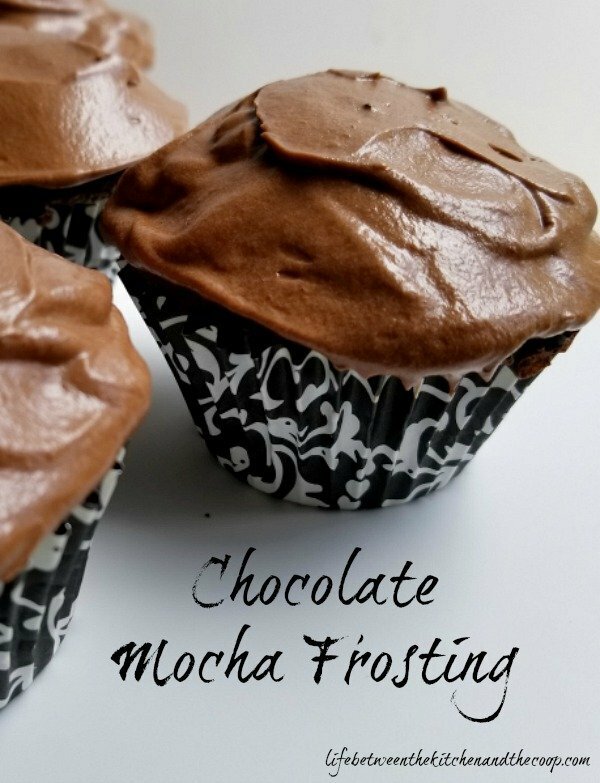 There you’ve got my grandma’s chocolate mocha frosting. That hint of coffee flavor just makes this frosting over-the-top awesome! A few weeks ago when we were in Kansas City, we spent some time with my extended family. While we were there, my aunt mentioned some of my grandma’s recipes that she had and I jumped at the chance to have her send me some of her favorites. 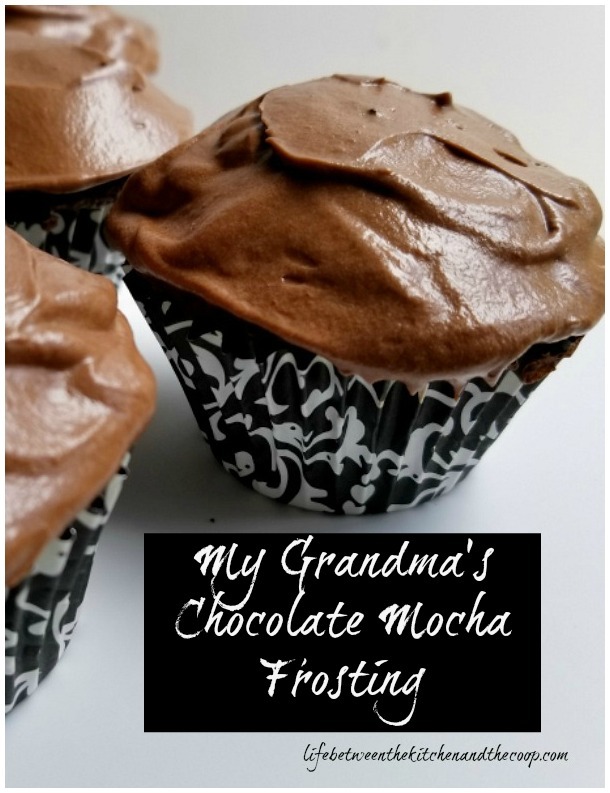 Among the recipes she sent was my grandma's chocolate mocha frosting recipe. 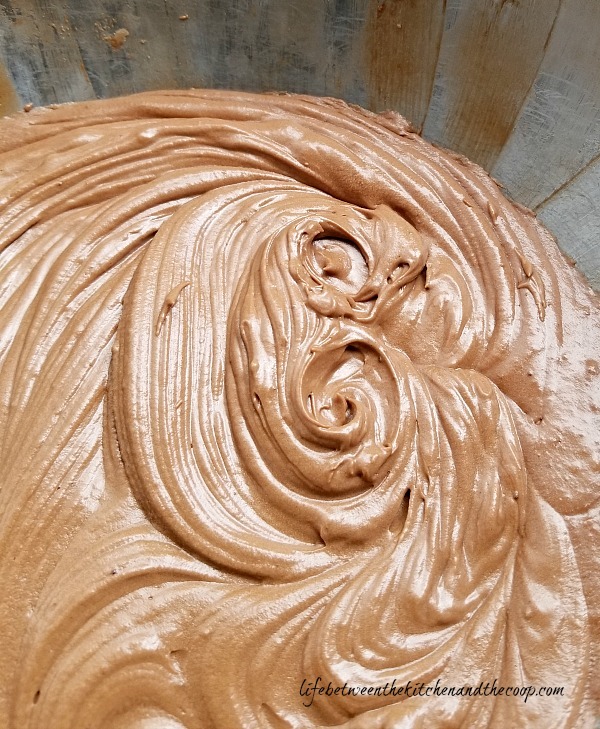 Coffee frosting, you ask? YES. You have GOT to try this one! 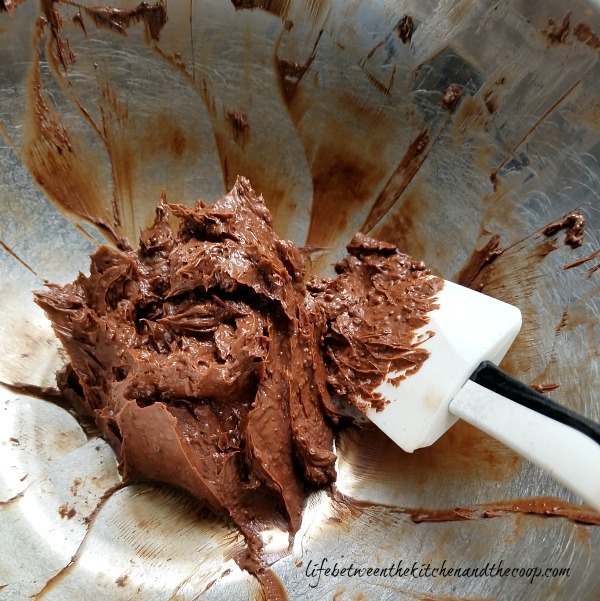 It's perfect for cookie or cake frosting! Add the confectioner's (powdered) sugar and coffee and mix until creamy. Now you can put that frosting on cupcakes, cake, cookies, or whatever! Enjoy! Be sure your cake or cookies are completely cooled before frosting them. If you love frosting as much as I do, be sure to follow my cake, cupcakes, frosting, and cake decorating board on Pinterest!